Nintendo seems to have a penchant for taking their DS retail releases and cutting them up into bits and selling them on the DSiWare service. 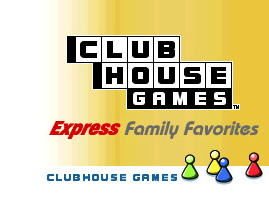 So it should come as no surprise that they're at it again with this second release in the Clubhouse Games Express series. This time around, they're offering up five more classic family games for you to enjoy, but are these small collections of games really worth the 500 Nintendo Points when the much more well-rounded and feature-packed DS retail release is available? 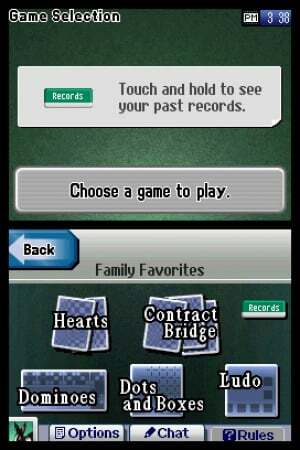 There are five family games in this collection: Hearts, Contract Bridge, Dominoes, Dots & Boxes, and Ludo. While Hearts, Bridge, and Dominoes should all be quite familiar to anyone that's ever sat around the family game night table, the latter two games are a bit more obscure, although Ludo is very similar to the popular board game Pachisi. Of course, that's not to say that they're not equally enjoyable in their own unique way, but most gamers who are actually considering this title will likely be drawn to the more familiar games. When you begin the game, you'll select an icon to use and then be taken to the main menu. From here you can select to play the games as a single-player experience or bring some fellow gamers in on the action using the game's local wireless multiplayer mode. Since the game doesn't offer any Wi-Fi support, it's local multiplayer or nothing. 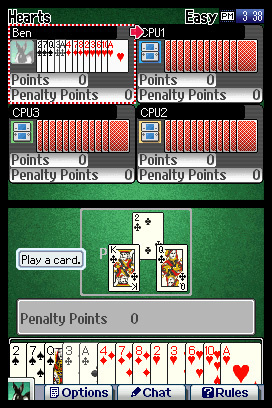 The individual games offer varying number of players, generally allowing 2-4 players, with the CPU taking control of any unused playing slots. Each game also features its own set of options that allow you to play using varying sets of rules. Control is very intuitive and much of it is executed using the stylus and touchscreen. The games will even allow you to view the rules or chat with other players if you're so inclined. The visuals can best be described as minimal. There's not a lot of fancy backgrounds and the cards and dominoes are fairly standard in design. In truth, there's not a real need for a lot of flashy visuals with games like these anyway. The visuals do a more than adequate job of making the objects and playing fields easily distinguishable and that's what really counts. The audio presentation is also fairly basic in design and presents you with some wildly unique musical tracks to listen to while you play. The sound effects are pretty authentic and add a nice touch to the game's audio experience for those who can keep their expectations in check. You can even gift someone one of the individual games and send it wirelessly to their DSi or DS system. The only catch is you can't play the multiplayer games with them using this method as the other person must have a DSi system and the game in order to play in multiplayer mode. It's still a nice little touch for those around you who don't have a DSi system and just want to enjoy one of the individual games. To play the multiplayer game you have two options. You can either create your own or find an already existing room. It will then list all players in the rooms or within your system's wireless range. You can then select the people you want to play with and the game you wish to play. While these games are enjoyable enough as a solo experience, they're honestly much better if you can round up some people to play them with. But even if you don't have any other players around, you can still select Friend Ranks that will let you view all of the rankings from anyone you've played the multiplayer game with before. The games in this second Clubhouse Games Express package are all good fun and certainly executed well, but it's difficult to recommend them too highly when you can get the entire package of games for less than $20. If these particular games are your favorites, or you just don't feel like springing for the entire retail release, this collection might be of value to you. That being said, most players that enjoy these types of games would likely get much more enjoyment and value out of the retail release. Yeah, I already have the full retail version of this, so I'll pass. Good review though. Unfortunately, this will end up selling which will encourage Nintendo to pull this stunt more and more often. The potential for DSiWare to be great is there, but at this point I tend to regret investing the money for the upgrade. Perhaps when the DSi exclusive games comes out the extra expense will be justified. The retail version is a much better deal than this DSiWare stuff. Third? What is the third referring to? 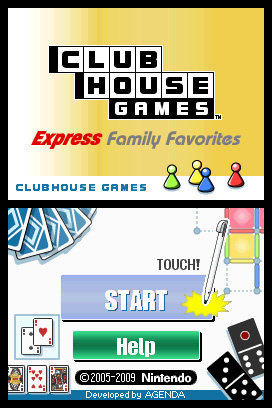 This is only the second Clubhouse Games Express to get released outside of Japan. I thought that I downloaded a lot of dsiware games and I only have 8. You have about a third of the whole shop though. the titles I have are: MFC, MvDK Mini's march again, Asphalt 4, Art Style: Aquia, Pop & Solo, Dr. Mario Express, the Internet Browser, and Flipnote Studio. Must be a typo. THis is the second installment... Unless he's referring to the other title for the first... "A Little Bit of..."
Ludo obscure? It's one of the most well-known board games ever. And what is "Pachisi"? Never heard of.